Here's why one tropical paradise gets more travelers to come back than any other. As the weather gets colder and winter approaches fast, you’ve likely found yourself daydreaming about beautiful beaches, sunny skies, and 80-degree temperatures. You might even be battling seasonal affective disorder. If you’re seriously considering a tropical getaway, especially around the holidays, you’ll have some planning to do. Firstly, and most importantly, where will you go? There are thousands of islands in the Caribbean alone. It’s impossible to know which one is the best, right? Well, as a matter of fact, one island does rise above the others in terms of visitor satisfaction: Aruba. Over half of travelers to Aruba return at least once in their lives, with some returning annually. Thankfully it’s not one of the 16 places that have been ruined by tourism. For one thing, Aruba is a relatively small island—only 19-and-a-half miles long and six miles wide—and taxis, public transportation, and car rentals are easily accessible. It’s also outside of the hurricane zone, so you’ll be safe from the elements. Like most Caribbean islands, the weather is great and the water is beautiful (both in color and in temperature; the ocean waters remain around 80 degrees nearly all year round). 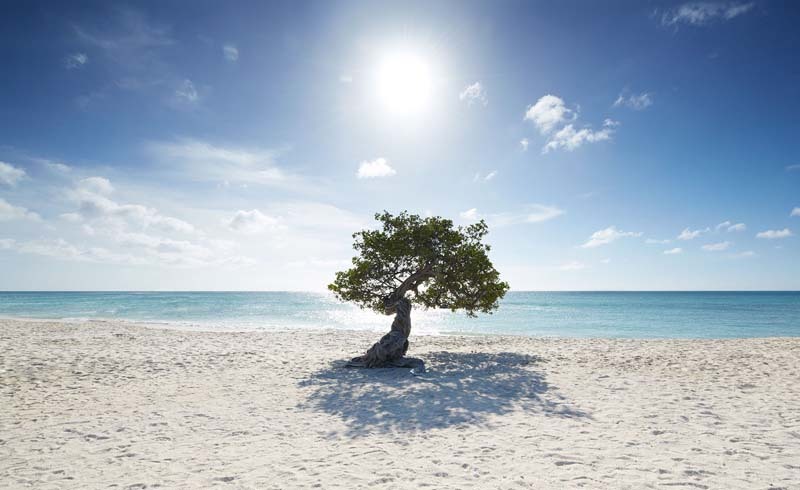 Aruba’s outdoor temperatures usually hover around 80 degrees—more than hot enough to entice you to take a dip in the water, but not humid enough to be uncomfortable. Its strong offshore winds also make it a great spot for water sports. Plus, it’s one of the 12 best off-season travel deals you can book now. If you like the bustling resort experience, check out the beautiful Palm Beach and its surrounding resort hotels. If you prefer a quieter, less crowded beach experience, the nearby Eagle Beach is probably the spot for you. And there’s more than just beaches, of course: the island is full of excellent restaurants, shops, street vendors, and nightlife. U.S. dollars are widely accepted at stores and restaurants. On the less developed side of the island, there are plenty of great spots for hiking and sightseeing as well. Finally, the atmosphere of the whole island is one of happiness and kindness. Unlike some of the other Caribbean islands, Aruba is pretty safe for travelers beyond the confines of resorts. Though Dutch is the official language since Aruba is a Dutch territory, most of its residents also speak English (as well as Spanish and the local language, Papiamento). 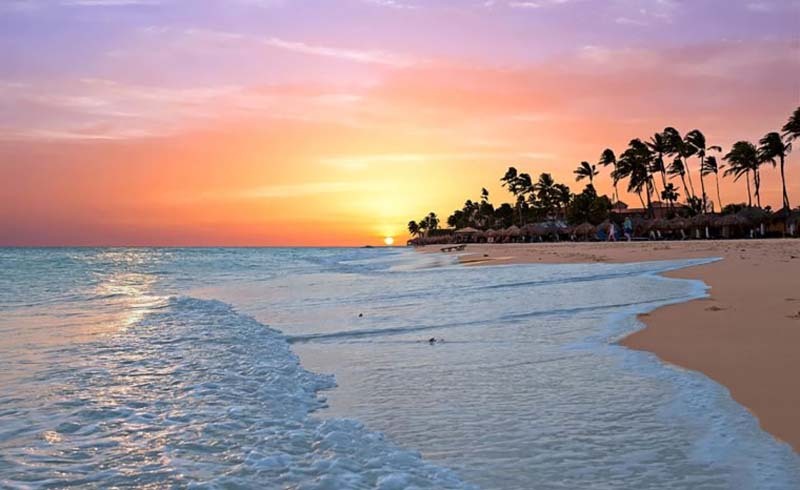 The friendly, welcoming attitude of the locals, who hail from all over the world, has earned Aruba the nickname “One Happy Island.” And that one happy island has created lots and lots of happy tourists. So if you take a trip to Aruba, odds are—literally—that you’ll leave wanting to come back. If you’ve already be to Aruba more than once, it could be fun to check out one of these 12 European islands you never thought to visit—but totally should.